Chlorine is universally used to disinfect water, by killing bacteria and other microorganisms. But once it arrives in your home, chlorine can negatively affect the family’s personal appearance, comfort and even long-term health. All of our shower filters are made by Sprite with KDF® (a copper and zinc alloy) and Chlorgon® (a non-carbon media) to remove more chlorine at a wider temperature range than any other. Millions own water filters to remove chlorine from drinking water. But 50% of chlorine exposure occurs in the shower. Unfiltered shower water can increase their exposure to chlorine by absorption through the skin and by inhalation of chlorine vapors. Sprite’s filters reduce chlorine for softer hair and smoother skin. Now you can fight brittle hair, dry skin and dandruff - where health and beauty begin - right in your shower. Breath easier. Scientific studies have linked chlorinated water to potentially harmful health conditions. Chlorine vaporizes in hot shower water and, when inhaled in the lungs, is transferred into the blood stream. Shower filtration reduces harsh chlorine vapors - so you can breathe easier. 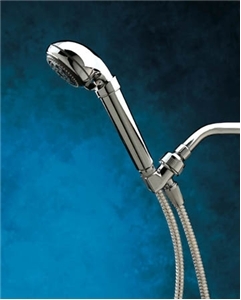 White plastic housing or all brass housing; use your own shower head; cartridge life rating of 1 year. 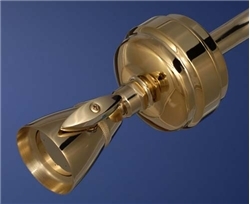 Brass housing in polished chrome or polished brass; with or without shower head; cartridge life rating of 6 months. Filter and shower head all in one; 5 way massage spray; cartridge life rating of 6 months. Filter is built into the hand held shower head; 5 way massage spray; cartridge life rating of 3 months. 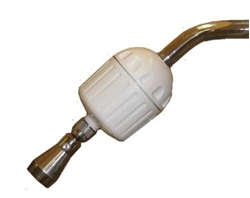 Attaches to any hand held shower head; cartridge life rating of 3 months. We haven’t forgotten you! The lack of threads on tub spouts makes traditional filtering of bath water impractical. But you can remove the chlorine a couple of other ways. Sprite’s Mediterranean Blue Bath Salts feature the same patented Chlorgon® in crystal form along with sea salts and epson salts. No scent or fragrance; can be used with other bath products. Simply pour a capfull in the bath and voila! Chlorine free water. The Cuzn Bath Ball, by Cuzn Water Systems removes the harmful effects of chlorine with the KDF Filter Foam Power Disk. Just hang the bath ball from your tub spout, allowing the water to pass through the ball. The KDF foam filter effectively removes the chlorine while still allowing the water to pass through the filter. No need to drag the filter through the water! Dechlorinates up to 26,000 gallons. To return to this page, use your browser's "back" button.